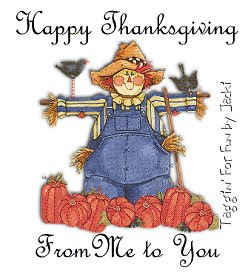 Just wanted to tell everyone that reads my blog Happy Thanksgiving!! To those that don't have a great weekend. I will not be posting anything until Monday, we will be out of town! Be safe and talk to ya soon!! 1. To be home with my family! 2. Have all my Christmas shopping done early! 3. Have time to do all the baking I want to do! 4. Everyone to be happy and healthy! 5. Snow.......lol don't think that will happen here in the desert!! What was the first thing you thought when you looked at yourself in the mirror today? Wow, my hair is a mess, must have tossed and turned all night. Do you have a recurring nightmare? Well I would not call it a nightmare, but a bad recurring dream, so yes I do! List three foods you can’t stand: Liver, Brussel Sprouts, and any kinda hard or gummy candy! Except for Candy Canes, and I don't eat them, just let them melt in my hot chocolate!!! Yummy!! Ok ya'll that's all I got for today!!! Got some knitting to get done, and found some really pretty Christmas cloths at Kris Knits blog, here is the link to see them http://krisknits.blogspot.com/. She has the prettiest cloths and I want to make up as many of these as I can for gifts for teachers along with some bath stuff from Bath and Body Works, think they will like it! So, off to knitting, have 4 teachers to take care of this year!! 1. What did you dream about last night? I don't remember what I dreamt last night. 2. Do you often have nightmares? Some times, but not often. Just a recurring dream. 4. Who is the most talent person that you know? My friend Sandy as she can knit anything and makes beautiful things! 6. Is there a new TV show that you would recommend? No new ones right now. 7. Who was the last person you phoned and why? Joe, to tell him that the movie the girls wanted to go see what no longer there, and we would have to go another time when a girly movie was out! 8. Who was the last person who phoned you and why? Dan to tell me that he was on his way home from work! 9. What was the last snail mail letter that you received? I got a Halloween card from Tiffy with pictures of Lexie!! Was a cute card that she made, she is also a talented person! OK, all I am changing some things on my blog so I can keep up with it more and spend more time writing and sharing with everyone! I want to try and post something everyday.......weekends when I can! I still will add some knitting off and on and things going on in our Family! I have some pics that I need to put on here from Halloween.........ugh and it is already Thanksgiving.....lol. But, better late than never!! Here is a new thing that I will try to be doing on Fridays!! Have a great day all! 1. The last band I saw live was: Oh my, like forever ago, I think like May 2000 and it was Clay Walker at a American Cancer event hosted in memory of Kayleigh, was a great night! 2. What I look forward to most on Thanksgiving is: Is spending time with family and going shopping with my Mother In Law and Sister's In Laws the day after!! We get up at like 3 in the morning and hit the stores, and shop till we can't stand it any more and go home and Rob, Dan's brother will have home made Turkey Enchiladas ready to eat!! We have so much fun doing this!!! I have not been able to do this for quite a few years, and missed it while we were in Farmington! 3. My Christmas/holiday shopping is: Almost done, I am trying to get better at getting it done early as I have some gifts that have to go to people that don't live near me, and we will be getting together with them over Thanksgiving, so will have that all done and delivered then!! 4. Thoughts of decorating my house for Christmas fill my head. 6. Bagpipes: Reminds me of my Dad.....he hated them, and I think the music from them is just awesome, I love them!! 7. And as for the weekend, tonight I'm looking forward to: going out to eat and going shopping with Allie for a birthday present she needs for a party she is going to tomorrow, tomorrow my plans include: driving to Lubbock with Joey and Brittany, dropping them at my Mother In Laws, and going to get my hair done WooT!! and doing a little shopping, and Sunday, I want to: spend the day in bed.....lol, but will get up and go to early church at 8:45am and then I have a baby shower to go to for Tiffany across the street!! Then coming home and chilling with the family and watching some football! !